(Damascus) They came to the near East in 2005 with the intention to live out the Christianization of the first centuries after Christ. Their history is comparable to the Trappist monks of Tibhirine in Algeria, who in 1996 were murdered by a moderate Islamic group. Xavier Beauvaus created a memorial for them and their martyrdom by the film "Of Men and Gods". The comparison is more pressing when one things of the five Trappists, who left their peaceful and isolated Cloister in Valserena in Tuscany, Italy, in order to go to Syria. A land whose internal situation had been already tense and in the midst of a civil war with thousands of deaths and flooded with hundreds of thousands of refugees. Why have they decided to found a new Cloister in an unstable country like Syria? "Because Christianity had developed here and spread from here to Asia Minor, Greece, Rome, Armenia, India and China", say the sisters. "in the first centuries the mission was led by a living Monastic movement, which existed alone and independently of one another here and in Egypt." The sisters recall St. Ephraem the Syrian, Saint Simeon the Stylite, St. John Chrysostom or St. John of Damascus, whose traces they follow. "Going out from our Latin and Benedictine Tradition we want to follow the stream, because we are convinced of the rich fruits, which will come about in an exchange between the West and Eastern heritage of Christendom." So the Cloister of Azeir exists amidst the civil war afflicted cities of Homs and Tartous in Central Asia. 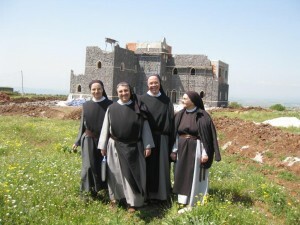 The sisters feel a mission in that, which resembles that of the monks of Tibhirine: to help Christians and Muslims without respect to religion, to be a lighthouse of peace and harmony in the civil war, which they did not foresee when the five Trappists set foot for the first time on Syrian soil. "Now we belong to these people. The fate of the Syrians is our fate," says Abbess Monica to AsiaNews. 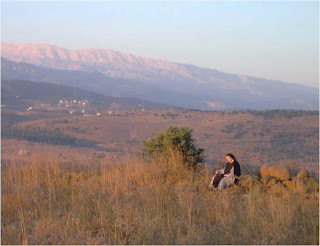 The nuns reported on their internet site established and independent of all propaganda of one of the other sides of the civil war and the fate of Syria's Christians. 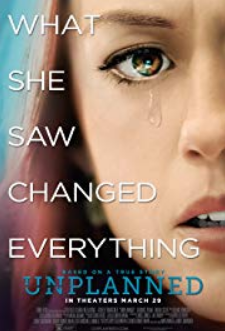 Some of the letters of the last months could have been called out. They described for everyone the suffering of the civilian population. For them the Cloister is clearly a sign of hope, because it is "a place, where God is really present through the Eucharist and through the Church, through the prayer and the brotherly community. It is a blessing for all." "Why should we go away?" was the astonished response of the sisters. "The people here ring our door. They seek help, diverse help. They ask for food, they seek consolation, young men have started to come to us, because they are seeking someone to help them to understand things, to reflect, to grow innerly." The Cloister offers already numerous people sanctuary and accommodation, people, who are have been made refugees by government troops or the rebels, people who are pursued by one side or the other. Even as a place for secret business, the Cloister is on hand. "We are called to give a witness of our Christian hohpe, which is stronger than all worry. Why should we go away from a place, where the people so desperately need this hope", said the Abbess to Asia News. 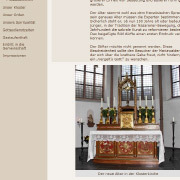 Edit: such a great feast for a profession as St. Pius V. Mariawald is the only Trappist monastery in all of Germany. The powerful Schola of the Gregorian Chorale, the Mass of Angels, of incense, the candles and not least of all the language of the Church transforming the church into the forecourt of Heaven. 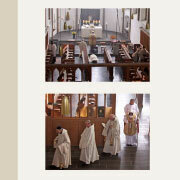 (kreuz.net) On April 29th Brother Maria Johannes OCSO made his solemn vows at the Traditional Abbey of Mariawald. The contemplative cloister is located in the vicinity of the 4,400 population city of Heimbach in the Diocese of Aachen. Many faithful gathered for the solemn liturgy. Only for such a joyful feast does the rarely used organ sound out in Mariawald. The powerful Schola of the Gregorian Chorale, the Mass of Angels, of incense, candles and not least of all the language of the Church transformed the church into a forecourt of Heaven. The profession itself began after the Gospel. Abbot Josef Vollberg addressed the candidates. He noted then that the profession is a contradiction to the decadent society, that it is calculated to be of commitment from beginning to end. Indeed the monk forsakes the lust of the world for riches. Then Brother Johannes sang his Profession, which he had previously been written on parchment. The document was laid at teh altar and then presented to the Abbot. The newly professed knelt down before the Abbot and his brothers. Then the Schola sang many verses of the Miserere-Psalms. Brother Johannes laid himself down as a sign of his humility before the steps of the altar. In four solemnly intoned prayers the Abbot bid the grace of God for the monk. It effects, with a distinctive bag formed cowl -- Cucullus -- a striking white monastic robe. During the vestiture the hymn "Veni Creator" was sung. Additionally, Brother Johannes had received the rite of tonsure in the form of a corona. It is a sign of conforming, to subjugation to the will of Christ. The corona symbolizes the hope, from Christ himself, who promises "the crown of life". The Pontifical Mass and the solemn Profession were concluded after more than two hours. Whereupon immediately began the mid-day prayer in choir. It underscores love and the monks' consciousness of duty, which does not allow that the Liturgy is something to be put off. The reception for the celebrating friends and guests had to wait. The women of the Cloister restaurant provided a vegetarian buffet. In the future Brother Johannes will be preparing himself for priestly ordination. The life of the Trappist is completely defined by prayer in choir. In the deep of night they arise at 3 am and sing in the first of the eight liturgical hours. The last takes place at 7:15 pm. The Old Liberal General Director of the Trappist Order in Rome wants the Abbot of Mariawald replaced -- and has fallen on his nose. 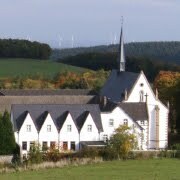 (kreuz.net) In 2008 the German Trappist Abbey of Mariawald in Eifel rd the privilege to celebrate the Liturgy and discipline of the Use of Monte Cistello of the year 1964. The Commission 'Ecclesia Dei' published the Papal decree, after which employees of the State Secretariat had attempted to make the papal decision disappear in a drawer. Abbot Dom Josef of Mariawald got such a free hand in his monastery, to reinstate the traditional rites and customs without having had to find democratic majorities. One third of the convention was for all of it, a third neutral and a third completely against. Moreover, it was hoped to give a new thrust to new vocations for the Monstery. However, when a handful of postulants could not meet the strenuous Trappist life - which is normal in such monasteries - and thus it happened that with no immediate flowering, those enemies of the Roman Rite within the order came on the scene. It should be understood here that there is a principle of the Trappist community the Trappists that there is a certain number of options about how to interrupt an abbot. So this was how the abbot of Maria Wald was sidelined by the advisory board. This, however, quickly lost its teeth, because the Abbot is a wise and strong personality and he doesn't pretend to see things as they aren't. Thus attempted an impeachment on the Order level. An abbot, however, can be dismissed only for canonical reasons and has the right to appeal if necessary to a papal court. Since Abbot Joseph has survived the critical month of September, in which he dealt with the General Council having survived politically, it has become clear that his position is not debatable and he will stay permanently. The term of office for this reformer Abbot will last until 2038. In between 1965 and 1975, the Trappists lost thousands of monks and nuns because of rampant old liberalism. Nevertheless, the relatively strict Trappist order still has twice as many vocations as members of the milder Cistercian order. Mariawald has threatened to flip over into a Buddhist meditation center in the past. At that time the Monastery was still on friendly terms with the Bishop of Aachen, Heinrich Mussinghoff. Mariawald is located in the Diocese of Aachen. Resignations, deaths and missing entries diluted an abbey which once had one hundred monks, more and more. There was at the same time the heroic sanctity of so many brothers, who were mainly working animals, who endured the suffering and the situation in a spirit of prayer and vicarious atonement. Brother Famian Gerwing who died in February was one of them. 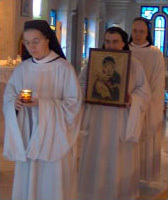 Since the silent monks of Mariawald have begun this year to keep silent for half an hour daily prayer before the Blessed Sacrament, they have again reported serious candidates for the contemplative religious life. German Trappists of Abbey Mariawald are returning to the Liturgy and the Discipline of the Fathers and are opening their own House Study. Abbot Josef Vollberg has according to reports of the website of the Trappist Cloister Mariawald, that a House Study will be established in order to form Priest-Monks. The organization and direction of the study falls upon the study director, Frank Erich Zehles. Zehles is the director of the 'Bernardus Publishers"
The House Study was established, so that the Monks could intensify their simple profession in the Community of the Cloister and so they might pursue their studies in the amazingly outfitted Library in moderate peace. Today - on the feast of Candlemass - begins the Summer semester of the Scholastic Year 2010/2011. The day's feast lecture for the inauguration was held by the New Testament Scholar, Klaus Berger for the Monastery and invited guests. He will teach exegesis at Mariawald. Also the famous philosopher Robert Spaemann will have his own role as an instructor. The Study Plan is directed upon Papal Encyclicals and Writings, those of the Popes since Leo XIII. to John Paul II. Authoritative are the corresponding Canons of general Church law, the Constitutions, the Ratio Institutionis, the Provisions of the General Chapter and the traditions of the Order. The program's requirements should require 10 semesters. The test times will be included in this time. In Seminares, Lectures, Tutorials and Revision Courses, will provide a solid basis for the priests philosophical, theological, historical and rhetorical education. If the Superior allows it, Monks in other Cloisters or clerical institutes of sanctified life could study at Mariawald. 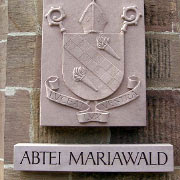 The Abbey Mariawald was endowed with the Papal privilege to take steps back to the old use of the Trappist Order, according to the use of Monte Cistello from the year 1964. Since then, the Cloister has had a throng of postulants, who in the meantime have become Novices.